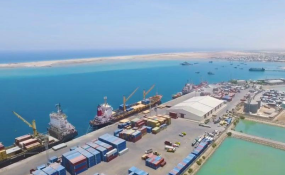 During a visit to the Port of Berbera - 154 kilometers out of the capital Hargeisa - Ali Ismail Mohamed, head of port operations with the UAE based DP World Group told Ethiopian journalists that the new tripartite port development project is set to take effect. "The construction of the first phase begins in September and bids will be awarded to potential developers," the operations head said. The Somaliland Port Authority has already consolidated port management operations and let DP World acquire positions in the management and operational activities at the existing port facilities. The USD 442 million port, according to Mohamed and his team, will be developed in two phases. During the first phase of development, both Mohamed and Allan Sanchez - project operations manager with DP World at the Berbera Port - said that a 430 meter berth is expected to be constructed which will accommodate two vessels at any given time. The overall expansion project will bring about a total of 800 meter wide berth that can dock five ships at a time. The existing port facility accommodates five major vessels on a 650 meter long berth. In case of Ethiopia's involvement, it is hard to find out how the government is taking part in the development activities. Given its 19 percent stake at the port, Ethiopia looks at shipping some 30 percent of its import/export trades. Close to 10 percent of the total volume of shipment will be directed to Port Sudan. Some 95 percent of the country's international trade currently passes through the Port of Djibouti. However, the project is seen as a threat by the Somalia and Djiboutian authorities. Somalia opposed the project claiming it has violated its sovereignty while Djibouti didn't like Berbera Port becoming a potential contender as it takes a considerable share of volume from what it currently enjoys. It is unclear whether Ethiopia's willingness to provide electricity to Somaliland is part of the port project deal. Mekonnen commented on a road project Ethiopia built that stretches to the border of Somaliland and this should not be mixed with the port project agreement. He stressed that the road projects are separately considered as parts of trade routes and corridors for development.